The Scheduler Interface Asset enables you to schedule actions using dates and/or times specified via Cron expressions. Any Intuiface action can be scheduled to run periodically at fixed times, dates, or intervals. This feature is particularly useful for Digital Signage-like applications where content has to be changed depending on the time of the day. 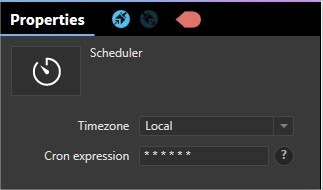 With the Scheduler you can specify times and intervals for navigating to a different space, hiding/showing content, changing on-screen text, etc. 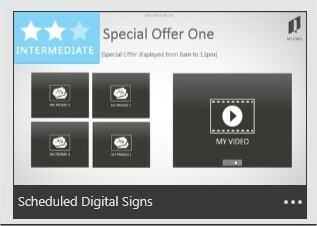 You can use the Scheduled Digital Signs template found on the New tab of the Composer and Player Experiences panel to try out this feature. Intuiface handles Cron expressions composed of five or six fields separated by white space. Special characters are used to create more precise time sets. This field is optional. If no value is entered - i.e. if you only supply values for five fields - a value of 0 is assumed. Asterisk ( * ): The asterisk indicates that the cron expression matches for all values of the field. E.g., using an asterisk in the 5th field (month) indicates every month. Hyphen ( - ): Hyphens define ranges. For example, 6-11 in the third field (hours) indicates every hour between 6AM and 11AM, inclusive. Slash ( / ): Slashes describe range increments. For example 3-59/15 in the 2nd field (minutes) indicates the third minute of the hour and every 15 minutes thereafter. The form "x-y/z" is equivalent to the form "first-last/increment". Comma ( , ):Commas are used to separate items of a list. For example, using "1,3,5" in the 6th field (day of week) means Mondays, Wednesdays and Fridays. We have found this online service to be effective at building cron expressions properly formatted for the Scheduler Interface Asset.